You may choose a one-time donation or recurring monthly donation. Please click the yellow "Donate" button to support the Southwest Museum of Clocks and Watches with a one-time secure, online contribution in the amount of your choice; or you may choose the "Subscribe" button to pledge a "RECURRING MONTHLY DONATION" in an amount of your choice. Payments are accepted through PayPal and major credit cards. Your generosity helps the museum maintain its magnificent, historic collections as well as pursue exciting, future endeavors. Your support is greatly appreciated! Read all about Gene Galbraith, his vision that created the Southwest Museum of Clocks and Watches, and the passion that keeps it ticking. Thank you to ALCALDE for the great feature! ​Click here to read the article: Making Time: Meet the Man watching over the oldest clocks in Texas. Visit the museum Saturdays 10am-4pm or by appointment by calling (512) 658-3853 to see it for yourself. Admission is always free. THANK YOU to everyone who has made the Southwest Museum of Clocks and Watches' new home in Lockhart a reality over the past year. Our volunteers, donors, directors and members have worked tirelessly to design and build a breathtaking new space to house and display our collection of timepiece treasures. The Museum is proud to be back, and better than ever. With your continued support, we will be expanding our galleries and bringing in new collections for exhibit in the new year. Come see this magnificent museum located on the historic square in Lockhart, Texas at 109 E. San Antonio Street, open on Saturdays 10AM - 4PM, or by appointment by calling (512) 658-3853. Admission is free, and donations are gladly accepted. We hope to see you soon! 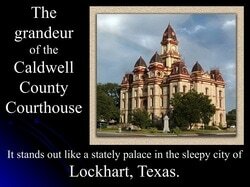 The Southwest Museum of Clocks and Watches is a proud member of the Lockhart Chamber of Commerce. 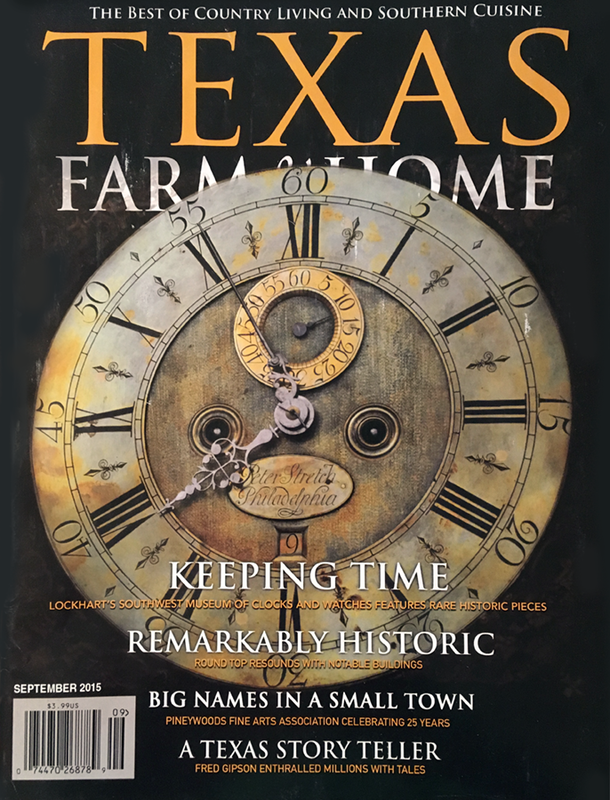 The Southwest Museum of Clocks and Watches was featured in Texas Farm & Home Magazine in September of 2015. The article tells the story of the museum, its restoration and preservation work, as well as an introductions to museum president, Gene Galbraith and several dedicated volunteers. Click the image below to read the full article. 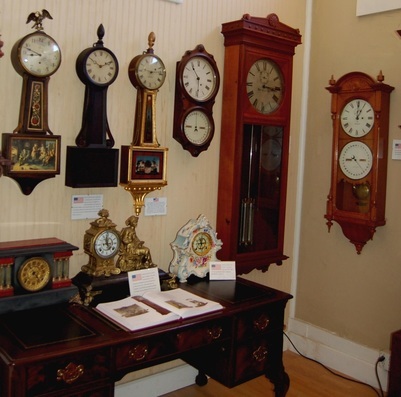 Click Here to see the Directory of Clock Museums in the United States. Click Here to see the Directory of Worldwide Clock Museums. 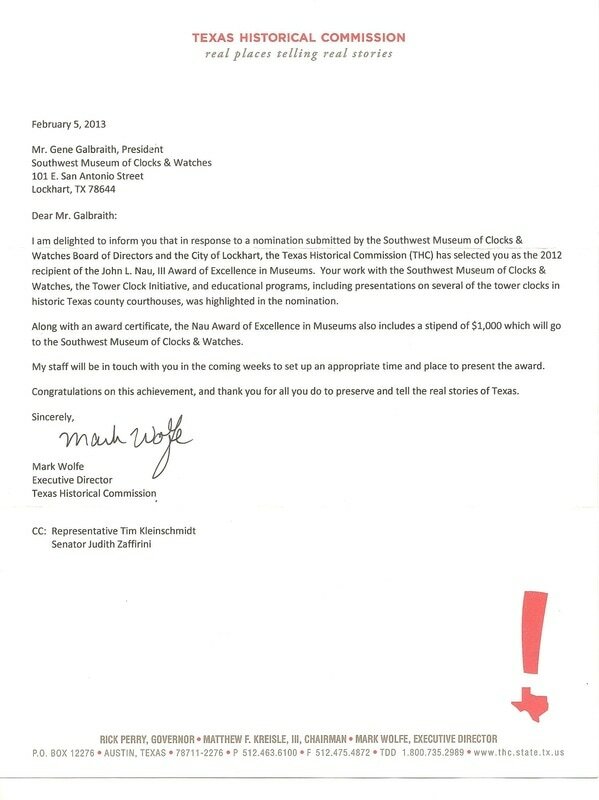 On March 23, 2013, just in time for the museum's 5 year anniversary celebration, the Southwest Museum of Clocks and Watches' president Gene Galbraith was honored with the Texas Historic Commission's (THC) John L. Nau, III Award of Excellence in Museums for his expertise in the specialized field of timepiece restoration. He was also honored for his work on the Texas Tower Clock Initiative, which focused on the stewardship, repair, and preservation of historic tower clocks in 15 historic Texas courthouses. In addition, Galbraith was recognized for his public outreach efforts to educate the public about the history of clocks through museum exhibits and other educational events. Read the full story on the Texas Historic Commission's (THC) website. June 17-21, 2014, The Southwest Museum of Clocks ​and Watches was awarded a blue ribbon and a medal for its Thwaites & Reed Tower Clock Exhibit to the NAWCC (National Association of Watch & Clock Collectors) in a National ​Convention in Milwaukee, WI. The physical exhibit was not moved to Milwaukee, but the story of this great clock was told in a special exhibit. From beginning to end, the restoration was shown in photos and captions displayed in the Convention Hall for NAWCC members from around the world to view. 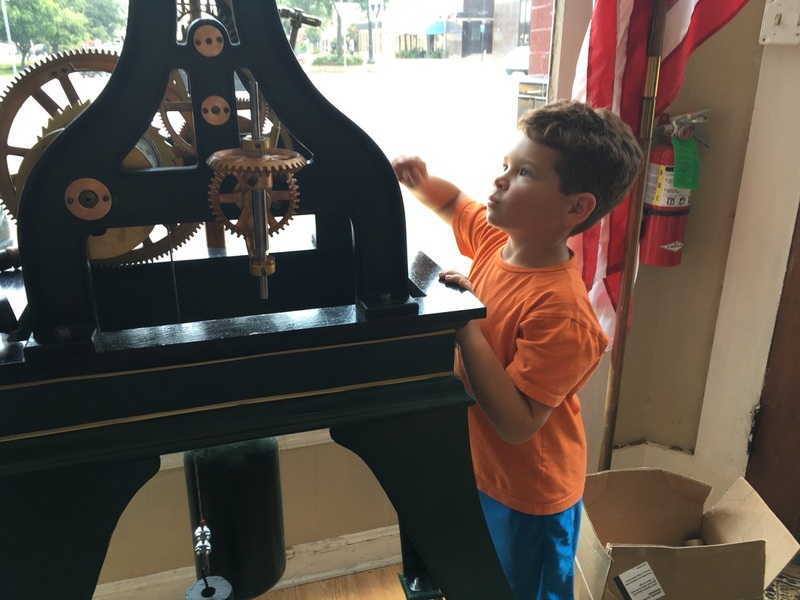 Above: Marty Humphrey (age 7) studies how the gears function inside a tower clock exhibit at the museum. Please click the yellow "Donate" button to support the Southwest Museum of Clocks and Watches with a secure, online contribution in the amount of your choice. Payments are accepted through PayPal and major credit cards. Your generosity helps the museum maintain its magnificent, historic collections as well as pursue exciting, future endeavors. Your support is greatly appreciated! The SW Museum of Clocks proudly exhibits Horological History throughout its magnificent galleries. Many clocks were made in America during the Civil War Period. Should it matter which side of the Mason Dixie Line they were manufactured as to whether they are worthy of preservation for posterity? Multiracial Americans were involved in the clock-making industry. 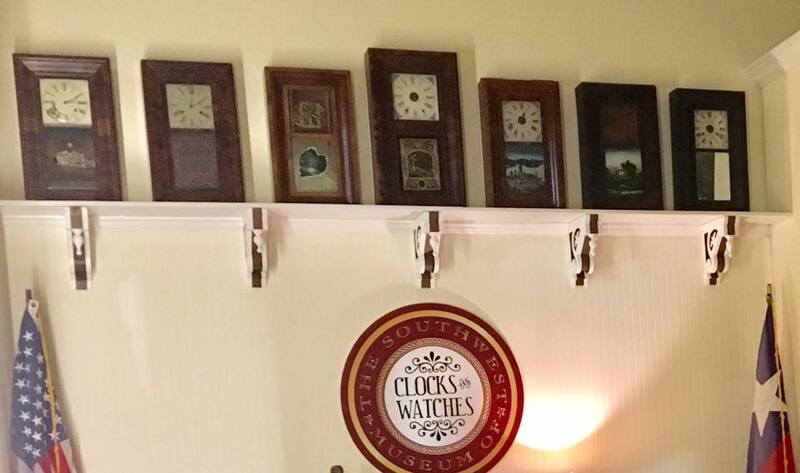 Which of the clocks shown in the photo were made by African Americans or Anglo Americans? All were made by both African and Anglo Americans, living in the North and the South; Unionists and Secessionists alike; United States of America and Confederate States of America! The Caldwell County Clock Tower is reflected in the glass windows of the former museum building, superimposing its image upon the museum's collections. The Southwest Museum of Clocks and Watches has a beautiful collection of rare and historically significant horological pieces from around the world, spanning three centuries.